In late fall of 1999, I wrote a short story entitled “Summertime” which I eventually included in my collection, Assumption and Other Stories (Bilingual Press, 2003). When the book reviews starting coming in, most noted that particular story’s unsettling premise. But what fascinated me more was the response I received via e-mail or in person from family, friends and strangers alike. More on that later. “Summertime” begins benignly enough. The first section of the story has the heading “6:53 a.m.” and we encounter a married couple having difficulty getting their young son ready for summer day camp. Claudio Ramírez and Lois Cohen obviously love their son, Jon, but as with most parents who must get to work, mornings can be a bit frustrating. Jon eventually gets dressed, fed and trundled off to Claudio’s car for the ride to camp. The next section is entitled “7:39 a.m.” and we switch to a dusty, small hotel room where we meet a sleeping man named Clem whose “head looked like a pot roast as it lay nestled heavily on the over-bleached pillowcase.” Clem wakes to begin his day. Clem is from Oregon and has driven to Southern California on a mission. The story moves along, switching between the Ramírez-Cohen family and Clem. We eventually learn that Clem’s “mission” is to perpetrate a hate crime. He eventually settles on the Jewish day camp that Jon attends. I paint Clem as an average person who feels belittled by the world and who hopes to have a “big day” that will put his face in every newspaper and on TV. He is no evil genius. But the evil he perpetrates is as harrowing and real as any better-planned hate crime. I wrote the story after we experienced the horror of Buford Furrow’s attack at the North Valley Jewish Community Center. As we all know, Furrow, a self-described white separatist, shot and wounded three children, a counselor and the receptionist at the Center. That same day, he murdered a Philippines-born postal worker, Joseph Santos Ileto. Furrow admitted to wanting to kill Jews. He also stated that Ileto was “a good ‘target of opportunity’ to kill because he was ‘non-white and worked for the federal government,’” according to then-U.S. Attorney Alejandro Mayorkas. For almost four hours that hot, horrible day, my wife and I didn’t know if our son, Benjamin, had been a victim. We huddled together with my mother-in-law outside the camp waiting for word. Unfortunately, because the police were concerned that the shooter or shooters were still in the vicinity, the children who had not been wounded had been whisked off to a safe house. A rumor ran through the crowd that a boy named Benjamin had been shot and killed. But eventually, we were reunited with our son. Frankly, I’m having difficulty writing these words because the memories are coming back, full and clear. But that’s one reason I wrote “Summertime.” I wanted to use fiction to remind others that ordinary people living in today’s world can be the target of hate crimes. And I also wanted readers to understand how easily hate-filled doctrines can be appropriated and acted upon by an “average” person. Now back to the various responses to “Summertime.” Most readers—particularly those who know my family—knew that Clem was based on Furrow. But several other readers had never heard of Furrow’s attack on the Center or his murder of Ileto. Those readers (most of whom do not live in California and who are not Jewish) expressed shock when I mentioned that the story was based on our own experience that day in August. And I expressed shock that they had not heard of the incident particularly since it had received extensive (if not worldwide) news coverage. But this confirmed my conviction that writing about hate—even if fictionalized in a short story—can indeed educate the public about how easy it is for a person to become a Buford Furrow. When I started writing fiction in 1998, I didn’t feel that I had the moral authority to write about anti-Semitism. Though I had converted to Judaism ten years earlier, my experience with bigotry was based on my ethnic identity as a Chicano. 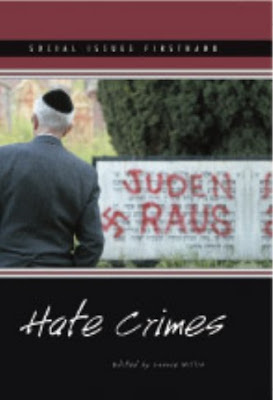 But after August 10, 1999, I earned the right to talk about one particular act of hate against Jews. I will go further: I now have the duty to remind others of what Furrow did that day. Why? Because if we forget, we help create a climate where it could happen again and the Furrows of the world will have won. And I don’t intend to be responsible for that.